The IASB at its January 23, 2019, meeting is poised to make more changes to its much-watched insurance accounting standard. The potential changes, outlined in papers released in advance of the meeting, are aimed at making the standard easier for insurance companies to follow versus fundamentally changing the premise of IFRS 17, Insurance Contracts. Published in May 2017, the new standard aims to make insurers shed light on the complex calculations and estimates they make about the promises they make to their policyholders and what they expect to pay out. It offers a comprehensive accounting framework to replace the bare-bones IFRS 4, Insurance Contracts, which the IASB issued in 2004 as a placeholder set of guidelines, never expecting it to still be in force 14 years later. The new insurance standard is scheduled to become effective in 2021, but the IASB plans to offer a one-year delay as it mulls further changes to the standard. “The amendments would not unduly disrupt implementation already under way or risk undue delays in the effective date of this standard, which is needed to address many inadequacies in the existing wide range of insurance accounting practices”, one staff paper states. The board plans to examine questions about accounting for insurance acquisition cash flows, reinsurance contracts, onerous underlying insurance contracts, and the recognition of contractual service margin. The board’s research staff is making several recommendations. The staff recommends that the IASB change IFRS 17 to require insurers to allocate to any anticipated contract renewals part of the insurance acquisition cash flows directly attributable to newly issued contracts and alter how to recognize them. The staff recommends also requiring insurers to recognize a gain in profit or loss when they recognize losses on onerous, or money-losing, insurance contracts, to the extent that a reinsurance contract held covers the losses of each contract on a proportionate basis. In addition, the staff recommends changing a small piece of guidance about insurance contracts with direct participation features. The staff recommends the IASB expand the scope of an exception for certain insurance contracts with risk mitigation features to include contracts with direct participation features that use derivatives or reinsurance contracts to mitigate financial risk. 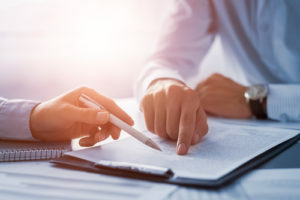 The staff is also recommending several tweaks to guidance on determining both insurance coverage and any investment return service when recognizing what the standard calls “contractual service margin”— unearned profit. Under IFRS 17, insurance contracts are measured as a sum of contractual service margin and fulfillment cash flows. Fulfillment cash flows are the present value of expected cash flows, which reflects financial risk, plus an explicit risk adjustment for providing the insurance coverage. Estimates about this figure can include information about the costs to acquire new customers plus expected claims. The IASB has been under tremendous pressure to change parts of the sweeping new standard ahead of when insurers must follow the new accounting. The board has agreed to make relatively small tweaks to some of the standard and also plans to give insurers until 2022 before having to implement it. But calls to make more significant changes and to allow more time to comply persist. In December, IASB Chairman Hans Hoogervorst at an accounting conference acknowledged the pressure on the international board and said getting IFRS 17 “across the finish line” was the board’s biggest priority for 2019. The standard is expected to result in major changes to how insurance companies draw up their financial statements. It is also expected to result in significant costs for international insurance companies. The insurance debate is expected to dominate the IASB’s January meeting, but three other topics are also on the board’s agenda. The standard-setter plans to hear oral updates from its research staff on two projects: rate-regulated activities and extractive industries. The board also plans to discuss the activities of the IFRS Interpretations Committee (IFRIC), including questions about recognizing deferred tax when a lessee recognizes an asset and liability at the commencement date of a lease. The IASB plans to discuss whether it should make a narrow update to IAS 12, Income Taxes, to address these questions.